The damaged Bruges archive documents were hardly repaired after their return in 1945. The shattered binding of the memorial list remained untouched, so afterwards parts of the back and the boards got lost for sure. The sewing of the binding is incomplete and severely damaged. Only three of the originally five bindings were (partly) present. The text section of the memorial list did get a rough repair. One side of every parchment leaf was covered with a piece of transparent paper of about 10 x 12 cm. However, this repair caused yet additional damage. While the paper was glued, water damage was caused, and after that, the glue showed through the paper, which made the parchment glassy and damaged the text round the bullet hole even more. The repairs also caused tension on the parchment leaves. All pages were very dirty. In April 2000, restoration of the memorial list was commenced. It was finished in August 2001. The restoration was committed to the workshop for book and paper restoration of Mrs Marijn de Valk (Middelburg, the Netherlands), assisted by the wood restorer Thijs Matthijsse for the restoration of the binding. The following paragraphs are especially based upon the restoration report and the notes of Mrs Marijn de Valk. The restoration was based on the preservation of the remaining historical information. New material was added as little as possible and is very recognisable, tested in advance and of the highest quality. All treatments can be removed without any damage. In a first phase, previous repairs were obviously removed as much as possible. Removing the glue marks completely was impossible sometimes as this would destroy text sections as well. When “demounting” the volume, a lot of attention was paid to each and every detail that may give us indications about the original binding and the manuscript’s quire structure. 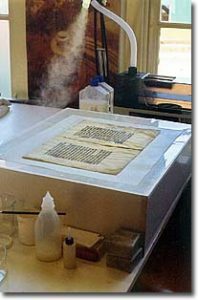 Subsequently, the different leaves of the manuscript were dry-cleaned. The second phase consisted of “fibring” the 33 parchment leaves on a purpose-made vacuum table. This means that the bullet holes have now been filled with parchment pulp. Parchment is very sensitive to moisture. Moreover the ink is also very water-sensitive and the text contains a number of very vulnerable decorated initials. As a consequence, treatments moistening the parchment too much were out of the question. When casting the parchment pulp, a fairly recent technique was applied, which was developed by the Brussels Royal Institute for art patrimony. A minimum of moisture surplus and consequently text loss restriction are the most important advantages of this method. Thereupon the long tears and the parchment quire backs were repaired using glue or narrow strips of intestine leather. The one paper double leaf was also fibred with cellulose pulp and repaired by means of hand-made paper. After flattening all leaves, the book-block could once more be sewed on five new bindings of tanned leather, according to the original sewing pattern. The wooden boards of the binding have been repaired while retaining the material left. The remaining parts of the oak boards have been mounted on a spine of aircraft triplex, the boards keeping their original thickness in one place. The missing parts, which are essential to the binding’s function, have been completed with aircraft triplex. Yet, the bullet hole and the shattered edges have been left intact as much as possible. The boards were then attached to the binding, the original leather was given a conservation treatment and a new leather binding was applied to the binding with wheat paste. The remainders of the old preserved leather were put back onto the new leather binding. The restored memorial list is now preserved in an acid-free adapted preservation box, also produced at the restoration workshop.